This fall, Murray’s is jumping the pond to find the next big cheese! Our staff are popping in on cheesemakers and artisan food producers all over Ireland, Spain, the UK and Italy to make cheese, taste cheese, and come back to New York to share stories and tastes with you. 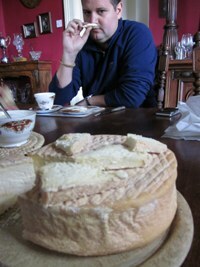 In our first installment, Louise Geller takes you on a tour of Ardrahan Farmhouse Cheese in the south of Ireland. When you’ve spent years enjoying a particular cheese as often as possible – in quick snatches from the counter, with a killer wine or beer pairing in the classroom, on a cheeseboard at home with friends and family – it is a singular experience to walk into the room where all of that cheese originated. This was on my mind as Jason (my colleague and partner in cheese on this trip) and I made our way south from County Tipperary to County Cork on a sunny Wednesday morning. Though rain had pounded for hours on the roof of the 18th century farmhouse where we’d spent the night, we were blessed with clear skies as we drove past untold numbers of sheep and cows happily munching on Ireland’s endless greenery. It was midmorning when we pulled up to Ardrahan Farmhouse Cheese in Kanturk, and Mary Burns greeted us with the traditional Irish hospitality that we would come to know and love over our weeklong visit. Mary is part of a third generation of dairy farmers: the family’s herd of Friesian cows was first registered in 1925. Their transition into cheesemaking comes from admirable roots: In the 1960’s, Mary’s husband Eugene was dissatisfied with the quality of cultured milk products available for his family, so he started making fresh yogurt, sour cream and cheese with the milk from his own herd. Twenty years later, in 1983, he and Mary founded Ardrahan Farmhouse Cheese and started producing their outstanding product on a commercial level. 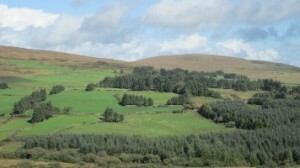 Today, Ardrahan is a modest but sophisticated facility. To begin our day, Mary outfitted us in hairnets and shoe covers and took us into the cheesemaking room. Twenty minutes prior to our arrival, the cheesemakers had added rennet to their vats of milk — so we were just in time to watch them cut the curd and mold it. The head cheesemaker, Pauline, gave us each a sample of freshly cut curds from the vat–they were slippery, sweet and incredibly fresh – and ready to become one of my favorite cheeses! Since Ardrahan is a moist cheese, the curds are cut into relatively big pieces. We watched as the cheesemakers scooped up the curds with buckets and deposited them into the molds, which had been neatly lined up on a table that runs through the center of the room. 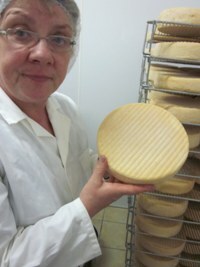 The cheese is lightly pressed (the mold and the press give the rind its distinctive lined appearance) and then brined in large vats before it is transferred to the caves. Jason and I were surprised to learn that Ardrahan is only washed a few times after it is made. 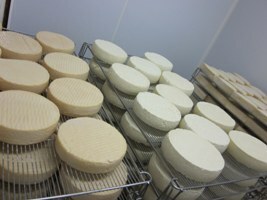 Many washed-rind cheeses are washed several times per week throughout the aging process, but it turns out that Ardrahan only needs a few initial washings to develop its pungent aroma – based on the high stink factor when we receive our Ardrahan at Murray’s, those are some active b. linens being cultivated! Our tour included a stop at the Ardrahan aging rooms, which were filled with the gorgeous co-mingling smells of milk and the ocean. We saw Ardrahan at several different stages of the aging process, from cheese that had been aging just a few days to a few weeks. The transformation is remarkable. By this time, we were dying for Mary to cut into one of the promising orange rounds. However, this being the land of Irish Hospitality, we waited until we were comfortably resting in the beautiful dining room of Mary’s home, with a freshly brewed pot of tea on the table. 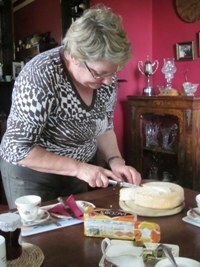 Then and only then, Mary cut into a wheel of Ardrahan that was made only two and a half weeks prior to our visit. In the states, Ardrahan is typically aged at least eight weeks, so having such a young wheel was a unique and exciting opportunity. The rind was already fairly aromatic, although the paste had a ways to go before breaking down into the pudding-like texture that we usually find at Murray’s. In fact, the center of my piece practically crumbled into curdy pieces, reminding me that just a short time ago this very bite had been a handful of glistening curds in the vat we had just visited. The Irish market prefers Ardrahan at around this age, while Mary says that most folks overseas prefer a more aged cheese that’s stronger and stinkier. As for me, I now think I can safely say there isn’t an age of Ardrahan I don’t love, though I would most prefer to do my Ardrahan snacking 100 yards from where the cheese is made, at Mary Burns’ table with a pot of tea, with the very cows who provide the milk strolling by outside. Taste Ardrahan with Louise & Jason on October 19th! I have just this minute learned about this cheese! I live in Amarillo, Texas, USA. How do I get some? Is there anything that is close to the taste of this cheese here in the States? Thank you for your website and attention!